It’s taken a while (nearly two years, to be exact) but the iPhone and iPad are finally getting some quality gaming peripherals. Ever since Apple announced plans to add physical inputs to its touchscreen platform, hardware manufacturers have been dropping the ball somewhat. 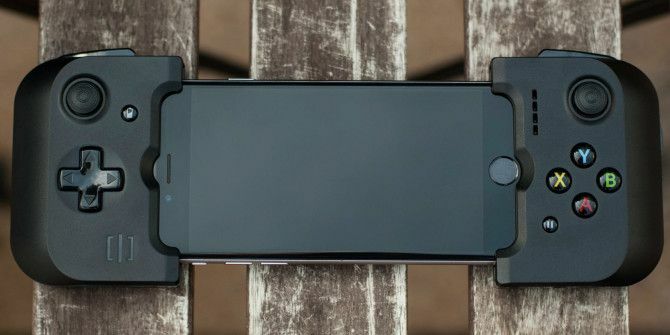 We took three of the best game controllers the platform has to offer — the GameVice for iPhone, PXN Speedy and SteelSeries Nimbus — and put each to the test. When Apple decided it was time make iOS controller-friendly Game Controllers & iOS: Here's What You Need To Know Game Controllers & iOS: Here's What You Need To Know Read More , instead of creating its own controller it set some fairly rigid rules and asked third-party manufacturers to deliver the goods instead. The “Made for iPhone/iPad” standard (MFi) allows hardware manufacturers know how to go about making their gamepads, Lightning cables, Bluetooth speakers, and other iDevice accessories. Apple came up with two specifications — a regular gamepad that includes a d-pad, two shoulder buttons, four face buttons, and a pause button; and an extended layout which includes analogue sticks, four shoulder buttons, four face buttons, and pause. Of the controllers released so far, the overwhelming majority have gone with the extended layout, and it’s those controllers we’re going to be focusing on today. We’re currently nearing the end of the third-generation of controllers. After newcomers like the Logitech PowerShell and MOGA Ace Power were superseded by the likes of Mad Catz C.T.R.L.i and the SteelSeries Stratus SteelSeries Stratus iOS Game Controller Review And Giveaway SteelSeries Stratus iOS Game Controller Review And Giveaway If you've ever gone out shopping for PC gaming peripherals, it's likely you would have encountered SteelSeries products. Read More , things finally started to get interesting. While the price of these $50+ controllers hasn’t changed a huge deal, the quality certainly has. Designed specifically for use with the iPhone 6/6s and Plus models, this pad is based on the oft-praised GameVice for iPad and iPad mini. Grips the phone and attaches via Lightning connector, comes with an integrated 400mAh battery which doesn’t charge the iPhone but offers charging and power passthrough via micro-USB port. Features an onboard digital-to-analogue converter (DAC) for use with headphones, as the headphone port is obscured while in use. $99.95 from Apple Store Online. Designed for use with iPhone, iPad and iPad mini, and iPod Touch iPod Touch 6G Review & Giveaway iPod Touch 6G Review & Giveaway If you own an iPhone — or any smartphone for that matter — why should you buy an iPod in 2015? Read More . Comes with a grip that holds all compatible iPhone models including larger Plus devices, also works with Apple TV. Connects to devices using Bluetooth 2.1 and features an internal 550mAh battery that charges via micro-USB port. RRP $120, available for $50 on Amazon. Designed for use with Apple TV, also works with iPhone, iPad and iPad mini, iPod Touch, and Mac computers. No grip to hold iPhone. Connects to devices using Bluetooth 4.0 How Bluetooth 4.0 Is Shaping the Future of Mobile Connectivity How Bluetooth 4.0 Is Shaping the Future of Mobile Connectivity Bluetooth is the forgotten star on the device specifications sheet. Read More , features internal battery (mAh unknown, rated for 40 hours) which charges via Lightning cable (not included). $49.95 on Apple Store Online. Before we decide what each of these controllers does best, it’s time to take a look at how the hardware stacks up. The first few generations of MFi controllers were notorious for flaky d-pads, unsatisfying analogue sticks and a cheap hand-feel. It’s time to see how far we’ve come. The GameVice is an interesting concept, and one that worked well on the iPad despite the tablet’s unwieldy size. The controller is split in two and features a tough rubber ribbon on the back, into which you slot your iPhone 6, 6s or Plus-sized model. This effectively turns your iPhone into something that resembles the PlayStation Vita, albeit with less games that take advantage of physical inputs. The GameVice for iPhone features relatively small, plastic analogue sticks that are best described as “not terrible.” Despite performing better than I thought they would when I first unpacked the controller, a rubber coating would make them more comfortable, and less prone to chipping over time. The sticks don’t slip out of your thumbs while in use, but there’s not a huge amount of travel so they’re not best-suited to games where subtle input is important — like twitchy shooters, or racers. The d-pad is a “plus” shaped Nintendo-style affair, and it’s as good as the pad found on many console controllers (vastly improving on the garbage that was the Xbox 360 d-pad). Positioning can take a little getting used to, but if you get on well with a PSP or PS Vita then you’ll do just fine. The face buttons are small but not tiny, and though I have big thumbs I didn’t have a huge amount of trouble with these. Unfortunately the GameVice for iPhone doesn’t include analogue triggers, instead opting for two clicky shoulder buttons instead. Proper analogue input here would make the GameVice better suited to racers and shooters, but the shoulder buttons aren’t that bad all things considered. There’s definitely something special about having your iPhone mounted in the center of the controller. It delivers a handheld console experience that none of the others can match. Despite a cramped interface, the controller feels pretty good in the hand — if a little cheap. Considering that this is the most expensive controller on the list, it would be nice if it felt a little more solid and less plasticky. Frustratingly, the GameVice uses its 400mAh battery to solely power the controller, offering no option to charge your iPhone while you play. I’d rather see the case pull its power directly from the iPhone and offer a charging option, but pass-through charging via micro-USB is handy. The battery did seem to last forever, though. The PXN Speedy takes the form of a traditional Xbox 360 controller, with a layout that’s virtually identical to Microsoft’s controller and an ergonomic design that tries to do it all. It’s probably best compared to something like the Razer Serval, and offers a compelling solution for the gamer who wants a jack of all trades. The analogue sticks are made of a comfortable, grippy rubber and offer a high degree of sensitivity. They certainly feel better than the plastic sticks found on the GameVice, but they’re also a bit “all or nothing” and require a bit more pressure to use than Microsoft or Sony’s controllers. This may be something you adjust to over time, but if you prefer lighter analogue sticks it can be a little confronting. In RPGs like Oceanhorn it’s not an issue, but controlling a car in GTA III and Real Racing 3 is more difficult than on either of the other controllers. Fortunately the d-pad, despite at first feeling a little bit floaty, is incredibly accurate. It doesn’t use a “plus” shape like the other controllers in this round-up, but hitting all 8-directions is easy and requires only the lightest of touches. It’s well positioned and comfortable to use, and will please fans of platformers or fighting games. The face buttons remind me of those found on the Xbox 360, which certainly isn’t a bad thing. Though a little bit squishy, it’s easy to apply varying levels of pressure; and the true analogue triggers are perfectly positioned with just enough travel and resistance. This is all helped by incredibly-solid build quality that gives Microsoft’s Xbox 360 controller a run for its money. Though the glossy finish is a fingerprint magnet, the smooth matte back provides plenty of grip which makes the PXN Speedy feel like a premium console controller. It’s weighty in a good way, and heavy enough to hold your iPhone in the grip while resting on a table. The 30-hour battery even lasts longer than some current-gen console controllers (I’m looking at you, Sony). SteelSeries are no strangers to the iOS controller game, and their previous offerings — the Stratus and Stratus XL — weren’t terrible controllers, though they weren’t without their flaws either. This time round the company has sought to bury the hatchet, and they’ve done while setting their sights firmly on the living room market with the a controller designed for Apple TV Apple TV 2015 Review Apple TV 2015 Review With competition from Google's Chromecast and Amazon’s FireTV reaching fever pitch, can Cupertino still hold its own in the battle for the space under your TV? Read More first and foremost. The Nimbus provides the best analogue performance of the bunch, with grippy concave sticks made of durable rubber that require the perfect amount of pressure to manipulate. I’m used to a PS4 controller, with Sony’s notoriously light sticks, and the Nimbus felt perfect to me. Even if you’re used to the Xbox layout, it’s probably worth persevering with the PS4-like layout for the consistent feel of the sticks that SteelSeries have delivered. While the d-pad is good, it’s not a knockout in quite the same way. Utilising a “plus” shape, hitting all four directions is easy, but things get a little mushier when you aim for the diagonals. It’s also quite large, with a concave design that some users may take issue with. It’s not a bad d-pad, it’s just not the best. The face buttons are near-perfect, well-sized, adequately spaced and slightly less squishy than those found on the Speedy. Just like the PXN, the Nimbus has excellent analogue triggers that are well-suited to shooters and racing games. The triggers and bumper buttons are actually larger than most other controllers, which makes using the Nimbus comfortable even if you have giant hands. The SteelSeries isn’t as weighty as the PXN Speedy, but that doesn’t mean it doesn’t feel fantastic in the hand. It’s definitely more PlayStation-like, both in terms of analogues and hand-feel, and just like the PXN it’s heavy enough to provide a weighty quality that’s indicative of a solid build. In terms of battery life, the Nimbus is rated at 40 hours and this additional play time is probably a result of the more efficient Bluetooth 4.0 technology it uses. Charging via a Lightning cable Lightning Cable Review Round-Up Lightning Cable Review Round-Up We've reviewed the best Lightning cables currently available. Read More is convenient, because I’m always carrying one in my bag, but it’s a shame SteelSeries don’t give you a spare in the box. I did notice one annoying caveat — you can’t charge the Nimbus using the USB cable on your Mac while connected to your iPhone or iPad via Bluetooth. This is how the controller functions as a Mac gamepad. For most people this probably isn’t a going to be an issue, but I thought it was worth noting. By now you’ve probably noticed each of these controllers have their pros and cons, and that each has a different use scenario in mind. Which controller you should choose (assuming you don’t go for one of the other options) entirely depends on how you think you’re going to be using it. For iPhone gaming, you can’t really beat the way that GameVice essentially transforms your smartphone into a handheld console. It feels natural, it looks great, but for $99 it’s incredibly limited in scope. It’s arguably the most portable of the three, but it’s still not that portable; and it’s uncomfortable in your pocket when coiled up. You can’t use the GameVice with an iPad or Apple TV even if you wanted to, and it’s a little too big to use with an iPod Touch or iPhone SE. The on-board DAC isn’t great, and sound is somewhat muffled and distorted at times, but you’re stuck with it if you want to use headphones because the controller completely obscures your 3.5mm headphone jack. For some, the analogue sticks will feel unforgivably iffy, the layout cramped, and a lack of analogue triggers a missed opportunity. If you can overlook or learn to live with these issues, the GameVice is a purpose built compact controller you might just learn to love. If you like the concept but you’d rather do your gaming on a tablet, check out the GameVice for iPad or iPad Mini instead. PXN’s Speedy looks like the do-everything option, and it features one of the best iPhone grips out of all the traditional “console” controllers. If you’re used to console controllers from the likes of Microsoft, you’ll feel instantly at home; though the analogue sticks are a bit stiffer than those seen on current-generation consoles. iPad and Apple TV compatibility is a huge plus, which makes the Speedy the best choice for the gamer who doesn’t really know what he or she wants from a controller like this. You don’t have to use the iPhone grip either, it’s fully removable, so if you want to sink hours into Knights of the old Republic on your iPad it might be best to remove it. That iPhone grip has a small amount of give in it, but it still feels like it’s tilted slightly too far forward for my liking. It’s sturdy, accomodating, and rubberized; it doesn’t interfere with the volume or power buttons and your 3.5mm stereo and Lightning ports are exposed at all times for headphones and charging. SteelSeries’ Nimbus is probably the best controller on this list, and the best controller available for iOS and tvOS right now. It’ provides a solid gaming experience for iPad and Apple TV gamers, and there’s even a workaround for iPhone users in the form of the Nyko Xbox One Clip. This $10 smartphone grip allows you to attach your smartphone to an Xbox controller to make use of SmartGlass functions, but it works a treat on the Nimbus too. In case you don’t fancy it, you can still use the Nimbus with your iPhone over Bluetooth, simply by propping it up on something. I have Joby’s GripTight tripod mount and stand ($29) which I bought for shooting reviews, and it does the trick. The Nimbus provides excellent performance, turning your iPad into a portable console and unlocking the gaming potential within your Apple TV. OS X compatibility is a plus, but I still prefer a PS4 controller for the odd game I do play on my Mac. Hori HoriPad Ultimate: Featuring a PS4-like layout and proper analogue triggers — $50. Hori HoriPad: The Japanese manufacturer’s original controller, no analogue triggers but a solid bit of kit otherwise — $60 on Amazon. Tt eSports Contour: Xbox layout with a similar iPhone grip to the PXN Speedy — $65 on Amazon. Many more older, first and second-generation iPhone controllers like the Mad Catz C.T.R.L.i ($50 on Amazon) and MOGA Power Series ($11 on Amazon) — cheaper than they were, but ultimately disappointing. If you’re after the best controller money can buy, and you’re willing to spend $10 more for Nyko’s smartphone grip; the SteelSeries Nimbus is probably the best controller you can buy right now. The PXN Speedy is a close second, but the analogue sticks are too stiff for my liking. Buy the GameVice if you can overlook the flaws and want a PlayStation Vita-like experience from your iPhone. At long last iOS gamers have quality to choose from, and the SteelSeries Nimbus won’t disappoint. Get Nyko’s smartphone grip for a truly portable, console-like gaming experience. Explore more about: Game Controller, iPhone Game, MakeUseOf Giveaway. Do you need the Nyko Smart Clip version for the PS4 or the Xbox for the StrelSeries Nimbus? The article mentions the Xbox variant but the controller seems more closely related to the PS4. Thanks for your help! How do these giveaways work? Any conditions to meet? amazing giveaway !! you are the best, thank you ! !